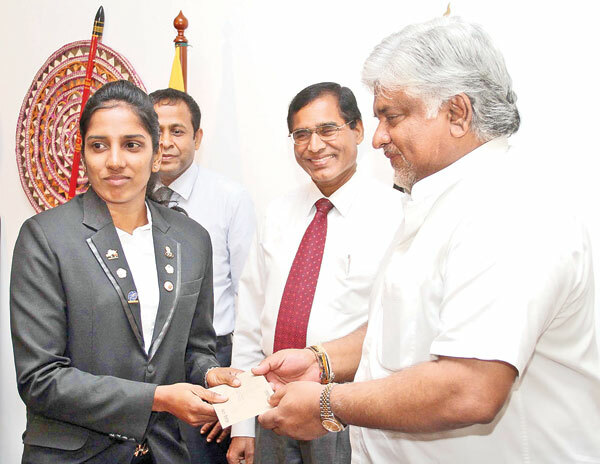 "Sports officials must work with more responsibility to develop sports," said former Test cricket captain and Ports and Shipping Minister Arjuna Ranatunga during a ceremony held to felicitate Ports Authority's South Asian Games athletes at the Ports Authority auditorium yesterday. He also pointed out that more than the Sports Minister the responsibilities lies at the hands of sports officials. "Even under the good governance government some Sports Ministry officials don't carry out their duties properly as they are influenced by money and power," he blamed. Three athletes participated at the SAG from Ports Authority. Janitha Surath (captain - volleyball team), Wasana Madumali (vice captain - women's volleyball team), Nilanka Sanjaya (volleyball) and the women's volleyball assistant coach Kalika Wasanthapriya who helped Sri Lanka to win silver medals in volleyball. They were awarded cash prizes and service promotions at the ceremony. Twenty-four time national billiards champion K. H. Sirisoma, who is also an employee of Ports Authority was given a service extension and a cash award too. Ranatunga revealed that a separate sports unit will be formed at the Ports Authority soon. "It is always sports clubs, institutions and sports personnel who pay the price for all misconducts of officials. To change this trend sports authority must take the necessary steps," Ranatunga stated. Hope sports officials will take it seriusly and show some good results.